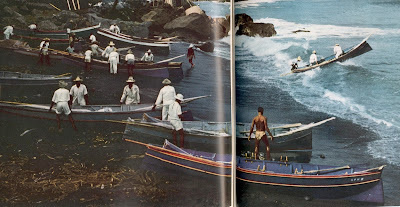 Let's discuss one final boat from Doulgas C. Pyle's Clean, Sweet Wind: Sailing with the Last Boatmakers of the Caribbean before it goes back to the small but stellar Rockport Public Library. It's the pirogue of Trinidad, the southernmost of the Antilles. All images from Pyle . Click to enlarge. ﻿ Looking, as she does, quite like a big modern outboard skiff, it's still fair to say that the pirogue has clear indigenous roots, for she is indeed yet another extended dugout -- extended in the sense that she has dugout base, to which strakes are added. She is not, however, also expanded, as in the gommier, canot, or Granadian sailing canoe discussed recently -- that is, the pirogue's dugout base is not forced apart in the middle to widen it. Pyle discusses the construction method at length, which I'll telescope here. 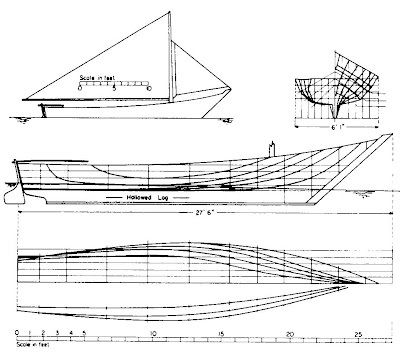 The dugout base, which really forms only the boat's keel, is sharp and deep on the outside (see lines drawings below), and hollowed inside. To it are added a long, straight stem and a broad, nearly vertical transom -- wider since the introduction of outboard engines, to provide greater buoyancy aft. The lowest, or garboard, strake is first nailed to the stem, then to the top of the keel, and finally to the transom. But it's not a typical edge-to-edge or lapped joint between the plank and the keel. Rather, the outboard surface of the garboard rests horizontally atop the keel and is through-nailed to it with galvanized nails. Subsequent strakes are lapped without bevels, and fastened with clenched nails. When Pyle observed the process in 1975, there was only one builder on Trinidad, named Taitt, and his methods (which is not to say his workmanship) were so refined that joggled half-frames were cut to patterns before being trimmed for installation. What is impressive is that no patterns or plans were used for any of the steps prior to cutting the frames, so the work that was all done by eye had admirable accuracy and consistency. The boat is finished with the installation of stringers, thwarts, wales, and a small foredeck. The lines of a Taitt pirogue seem to confirm its hybrid ancestry. The waterlines forward showed much greater hollow than I found in any small craft [in the Caribbean] other than the dugout gommiers and their derivatives, the yoles. Use of the shell as a keel points to a dugout origin here. The odd thing was that raising strakes should be lapped instead of fastened on edge as was done elsewhere with dugouts. One of Pyle's informants suggested that the pirogue "was of Amerindian origin, that raising strakes had been a development connected to the diminishing availability of large tree trunks for dugout canoes. He surmised that the notion of lapping had been learned from the Royal Navy, whose launches and tenders were always clinker-built." Although Pyle took the lines himself, and they are presumably accurate, these were from an outboard-powered boat, while the strangely low and long sailplan was based on a sketch from a native informant and seems less reliable. No sailing pirogues were in existence in 1975, engines having completely taken over. 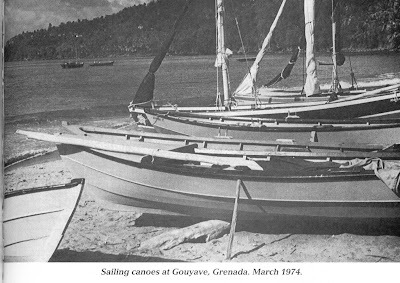 Still further south from the gommiers of Dominica and Martinique and the canot of St. Lucia is another expanded and extended dugout, the sailing canoe of Granada. When Douglas C. Pyle visited the island in 1975, "a handful" were still in use. It would be a surprise, though a pleasant one, if any still exist 35 years later. 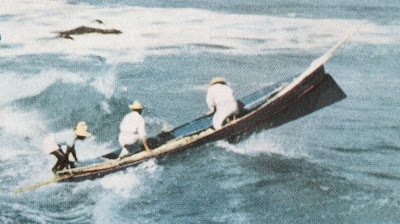 The Granada sailing canoe had something in the looks of a whaleboat. 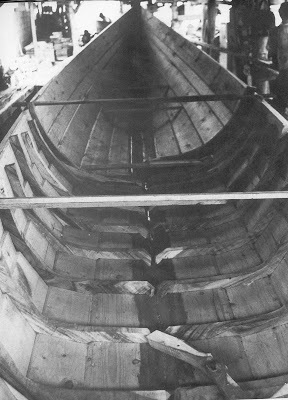 The dugout origins are just discernible in the small hollowed keel, to which three wide strakes have been added, followed by rough, widely-spaced frames and partial frames. The waterlines and buttocks are very nice, but the sections look scary. The sailplan looks fairly powerful for such an unstable hull, but it's wisely kept low. The lines show very clearly that no effort was made to give the hull any shape other than that assumed by a hollowed log wedged slightly open at midsection. They were propelled by sailing and rowing simultaneously, a practical mix in the flat water and fluky breezes that prevail in the lee of all high islands such as Granada. 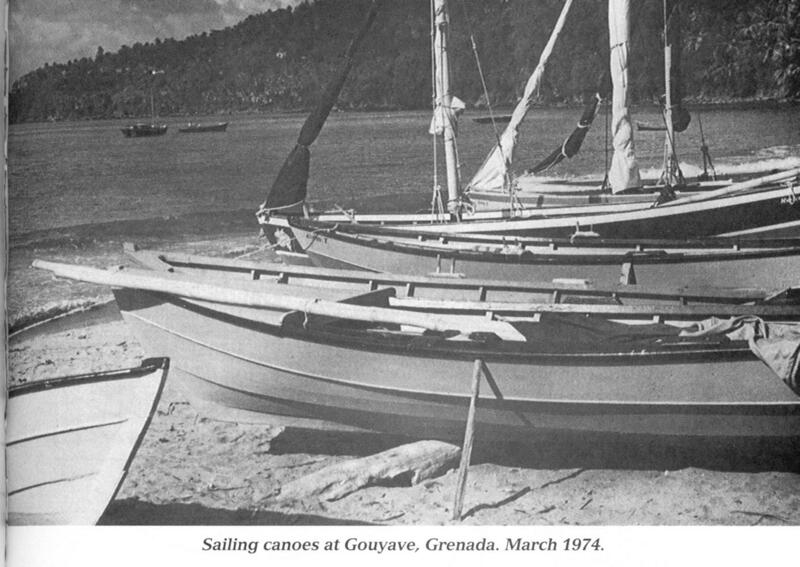 In spite of Pyle's criticism of their unsophisticated lines, he says the canoes were "versatile...capable also of operating in the open sea," and he describes a regatta in nearby Carriacou where the boats seemed to perform adequately, though hampered by their blue denim sails. In any case, I find the buttocks, waterlines, and sheer profile pleasing. The sections, however, are another matter. 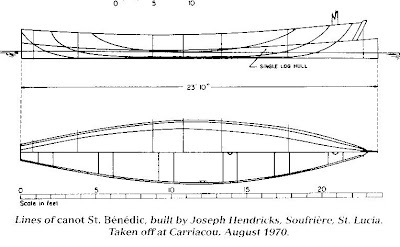 Where the bottom of the canot was just slightly flattened, and the gommier almost perfectly round amidships, the Granada canoe's bottom is nearly a rounded V. Lightly laden, this boat would have little initial stability, though I think she would firm up when heeled down onto her wide flared sides. We were nearing midchannel when something in the animated monotony of the waves caught my attention -- a flash that was not a whitecap, a motion not part of the heaving sea. A few minutes later, there was another visual disturbance, this time from a different quarter altogether. As the disturbances became more frequent, they also drew closer, slowly revealing themselves as human figures clad in yellow oilskins and topped by straw hats with fantastic high peaks. The figures seems (sic) to skim the surface of the water at high speed, darting this way and that like disembodied spirits. When the full reality was finally disclosed, the figures were seated by threes, one behind another in a canoe so narrow and so low in the water as to be invisible at a very short distance. 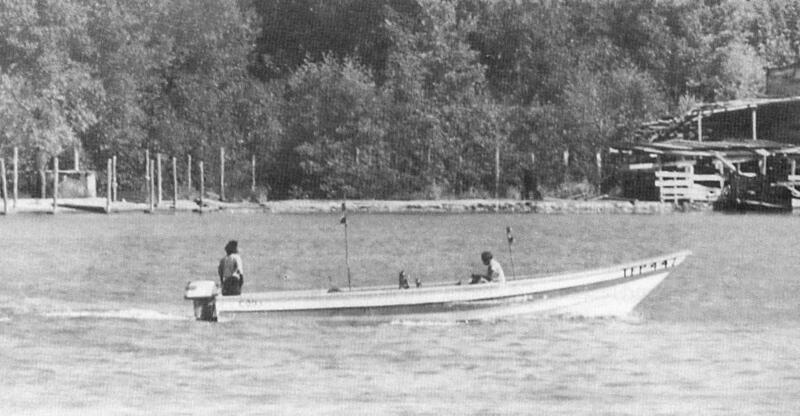 The figure in the stern was steering with the outboard motor; the one in the middle was bailing. In the bow, lifted completely clear of the water by the thrust of the motor, the third figure peered forward and gestured from time to time, sending the whole rig swerving this way and that. 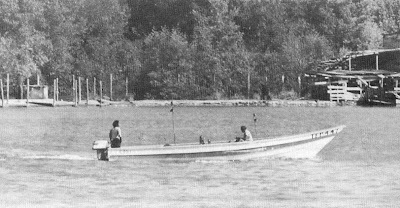 Like the gommier, the canot is primarily a fishing boat that, at the time of the Pyle's observation, was well in the process of conversion from sail to outboard power. The basics of the two types are certainly similar: an expanded and extended dugout with a single strake added to increase freeboard. 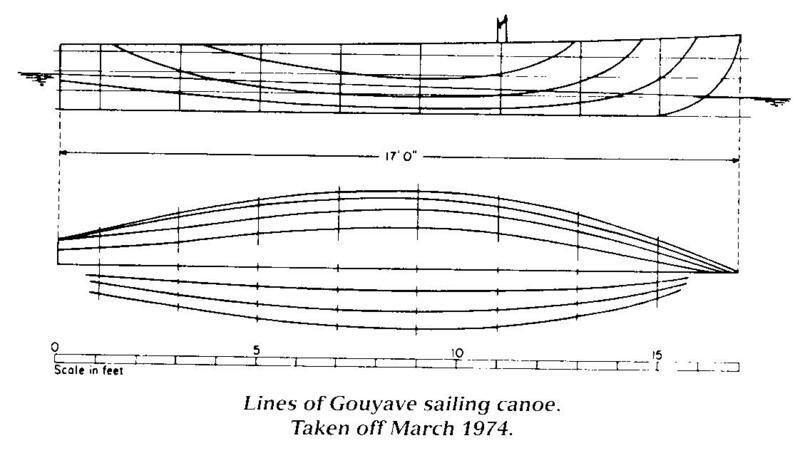 But as Pyle notes, the canot is "easily distinguishable from the gommier by the striking extension of the dugout forward into a sort of cutwater." Some of the examples of gommiers in the previous post showed a small extension, but nothing like the imposing "ram bow" of the canot. 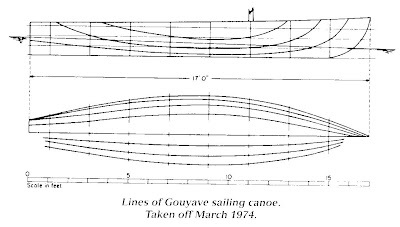 As Pyle also notes, the canot's midsection is quite a bit flatter, with a slack, but perceptible bilge, as opposed to the almost perfectly round sections of the gommier. 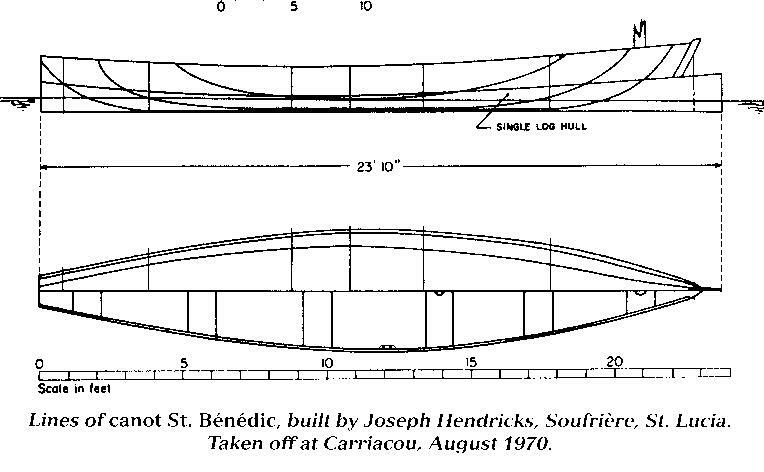 In addition, he notes the length-to-beam ratio is much longer in the canot; and "there is less freeboard in the bow, and the waterlines show less hollow and are less streamlined." In the late 1990s, the Gli Gli Project built a big (35') Carib canoe with the intention of sailing it from its home in Dominica to South America. The project's rather sketchy website doesn't tell the complete story, though, and it may be that the voyage was not completed. 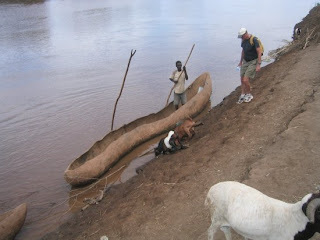 It's not clear from the photos on the site if the canoe was more like the gommiers of Dominica or the canots of St. Lucia. The Windward Islands -- i.e., the southeastern string of islands in the Lesser Antilles -- were populated by the Carib Indians when discovered by Europeans. Although subject to oppression and attempts at extermination by Europeans, pure Caribs communities and culture lasted longer than many other native New World cultures, due, it is said, to their ferocious resistance to European incursion, which resistance lasted several decades into the 18th century. Communities of Caribs, mixed with other races (predominantly Blacks) but still recognizably distinct, are still in existence on several islands, and a reservation of relatively pure Caribs still exists on Dominica. The dugout canoe was the indigenous boat of the Caribs, and like the people themselves, it remained in existence well into the modern era, modified, but still recognizable. While the pre-Contact versions were "pure" dugouts -- i.e., possibly expanded, but not extended -- their more modern derivatives are all extended with the addition of strakes above the dugout base. Most of what follows is from Clean, Sweet Wind , by Douglas C. Pyle (International Marine, 1998). 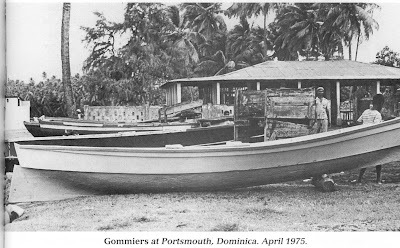 Gommiers were still in use in Dominica, the northernmost of the Windward Islands, in 1975. Their construction was fairly typical of dugouts around the world. The hull was hewn from a tree called gommier in several of the French-speaking islands. After the tree was felled, it was flattened on one side, and that side turned topmost. Coals were placed on the flat surface, then the charred area was scraped away -- originally with stone and shell tools, more recently with iron and steel. The process was repeated until a sizable amount of wood was removed, then inspection holes were bored in the bottom, along the centerline, and wood removal continued until the bottom was 3" thick and the sides 1". The bow was cut sharply vertical, and in the modern version, at least, the stern was cut square . After the holes were plugged, the hull was filled with water, into which were placed fire-heated stones. When the wood had softened, the sides were forced outward in stages with temporary thwarts of steadily increasing length. Wash-strakes were edge-nailed to the top of the dugout hull and a few frames added. Gommiers in Dominica. Note how the top of the sharp, tumblehome prow of the dugout hull extends a bit beyond the base of the added strakes. The gommier tree was still common on Dominica in 1998, but it was scarce on Martinique, and some Dominican builders would tow unfinished log hulls to Martinique for sale. 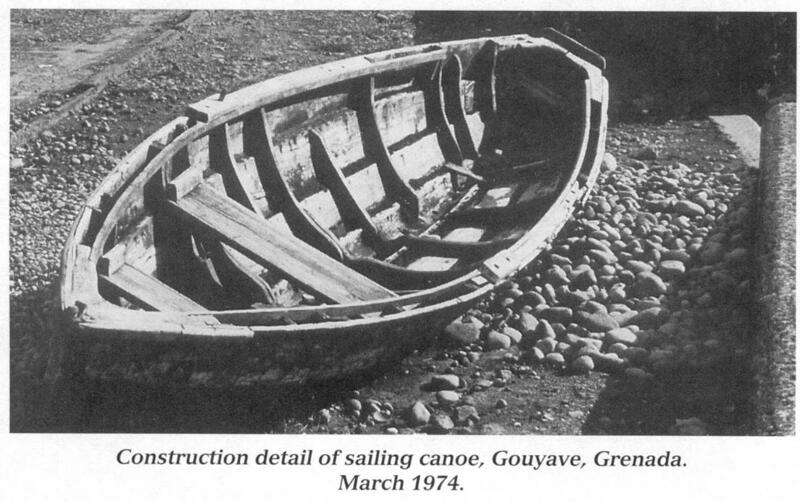 As of 1972, there were more than 2,000 of them registered in Martinique, mainly used for fishing, but the movement was already well under way to replace them with yoles -- very similar in form, but plank-built and hence easier to obtain and more economical. A 20'6" LOA gommier in Martinique, used for fishing by a crew of three. Note the very sharp bow and hollow waterlines fore and aft. Although the forefoot defines the forward perpendicular, the strakes fair into the dugout hull at the bow, unlike the setback of the strakes in the Dominica example shown above. 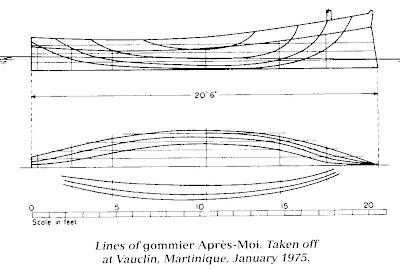 Sailplan and sections of the Martinique gommier shown above. In spite of their very round sections and nonexistent bilges, these boats are used in rough waters well offshore for fishing and for carrying cargo. (Douglas Pyle said this particular boat had been used to carry as much as a ton of cargo over 25 miles of open sea.) The small sailing rig is supplemental to the outboard engine which is its normal means of propulsion. The mast is unstayed, the sail a perfect rectangle, and the sprit bamboo; as Pyle says, "all very simple to set, stow, and sew." 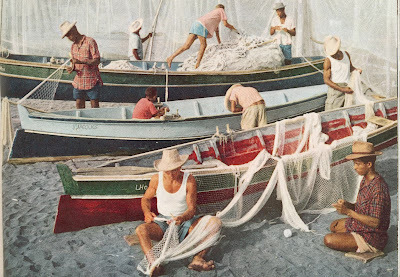 These gommiers appeared in the February, 1959, issue of National Geographic -- before the outboard engine was adopted widely by the fishermen of Martinique. They were launched through surf off the beach, powered by oars set in tholepins; the sailing rig was raised once through the surf. In this detail of the photo immediately above, note the extended bow of the dugout base, similar to the Dominican example. As beach boats, these are unusually fine and narrow compared to these examples from Portugal and Kerala, India, and Vietnam. Note how the stern man is as far aft as he can possibly be, and the rest of the crew is also fairly far aft -- evidently to help the bow rise over the waves. 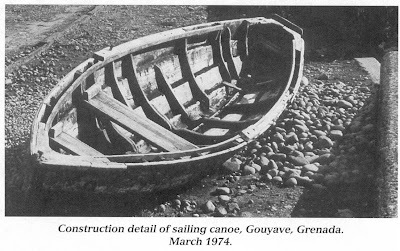 More gommiers in Martinique in 1959, with the extended-prow dugout base. Note the widely-spaced frames. Friend John Meader spent a couple days in Hong Kong recently and kindly allowed me to use these photos of the sampans he observed in the harbor. All photos may be clicked for an enlarged view. The modern powered sampan looks like similar to the traditional man-powered variety. The very high topsides obviously improve capacity and weather protection over more traditional models. Typically heavy used-tire fendering indicates these boats are used roughly. Any notion what the odd pipe structure at the bow is? Billboard boat crossing in front of a tour-boat sampan. Look at the amount of water this flat-fronted boat is pushing! I can't imagine that one would prefer to build a boat shaped like this, and it's almost equally hard to believe that it warped like this after it was put into use. The only remaining explanation is that no straight trees were available to the builder, who had to settle for this curvy one. It must be awfully hard to maneuver, but its owner gets bragging rights to "Most Distinctive" in the Indigenous Boats Beauty Contest.